Rev. Mercia Flanagan moved to Bangor in March 2018 with her (relatively) new husband Colm. 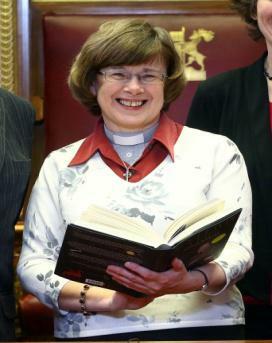 Mercia had been Rector of Carnmoney Parish in Connor Diocese for 14 years when she and Colm married in September 2017. She stepped down from full–time ministry in Carnmoney in January 2018 and was appointed part time Assistant Minister in St. Columbanus in April 2018. She will be retiring fully at the end of August 2019. However Mercia intends to remain an active member of St. Columbanus and will be happy to help when possible. Mercia has a special interest in the life and works of C.S Lewis and spent some time on sabbatical in 2012 as a ‘Scholar in Residence’ at Lewis’ former home near Oxford. Her research at that time focussed on how Lewis’ friendship with J R R Tolkien helped to challenge some of the sectarian attitudes which his Belfast background had produced. Her main hobby is Scottish Country Dancing and that together with walking the family dog, Teddy helps her keep some measure of fitness!